Everyone knows that too much sun is bad for the skin, but did you know that it can also scorch your hair? Here are 4 Ways to Improve Summer Hair. Creating a daily routine to ensure your hair goes from beach to office seamlessly is the key to great overall hair care. Whether you’re talking about your body or your hair, staying hydrated is important in the summer. After spending time in the sun, wind, chlorine, and beachy conditions your hair can start to feel dry and dull.Use a hydrating mask or invest in a deep conditioning treatment. We recommend Kevin Murphy’s Leave-In Repair hair mask. 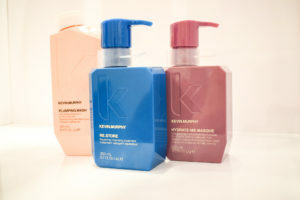 We adore Kevin Murphy because it nourishes damaged hair as well as protects hair from further damage. This means the more often you use the product the less you need to use and the better your hair looks. That’s a product that puts your beauty first and we’re happy to carry it on our shelves. Kevin Murphy Hair Products are sold at Xhale Salon and Spa. 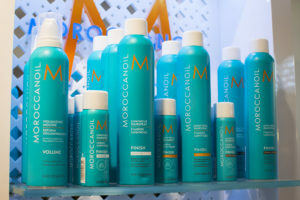 Combine a hair mask once a week with a daily hydrating shampoo and conditioner, such as Moroccanoil Hydrating Shampoo and Conditioner. This will ensure that every ounce of moisture is locked in. If you have naturally oily hair try applying the conditioner and leave in treatment only to your ends to target the dryness without weighing down your hair. Woman with a hair dryer to heat the hair. 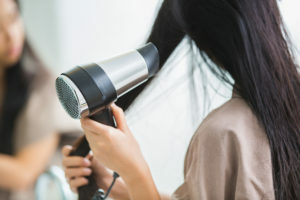 While it may be hard to put down the flat iron or blow-dryer, do yourself a favor and conserve energy! We all know that hot styling tools aren’t good for your hair, especially after being in the sun all day. Try letting your hair air try and use a wide tooth comb to brush out tangles. If you find yourself having a hard time dealing with frizz, try using a straightening cream. This product is designed to fill in the hairs cuticle so that is looks smoother. Use Kevin Murphy’s Straight Defense-heat protecting straightening balm. Simply squeeze a small amount of the bam in your hands and smooth over damp hair. I’m sure you have heard it before, but this is your final warning…Don’t brush your hair while it is wet! Your hair is weaker at the hair shaft when wet and brushing your hair while it is weak can cause some serious breakage. Try using your finger or a wide tooth comb if you are in a hurry, but never use a paddle brush on your wet head again! Your hair grows on average between ¼ to ½ inch a month, so scheduling a trim every 3-4 months ensures your hair stays healthy and strong. How often you trim your hair depends on your hair’s thickness, texture, and health. If you have finer hair more regular trimming is necessary because each strand of hair is more fragile. 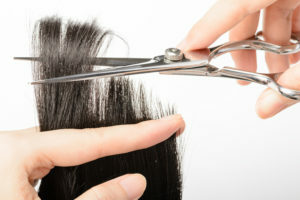 If your hair is curly or prone to tangles this may cause your ends to split more often, which means more frequent trimming during the summer season. Trimming your ends keeps your style looking sleek. Restoring moisture, ditching the heat of styling tools, brushing correctly, and routine trims are all helpful ways to ensure your hair is restored back to its true beauty. Creating a routine hair regimen with products and proper maintenance is a sure way to make sure your hair looks its best throughout the hot summer months and into fall.